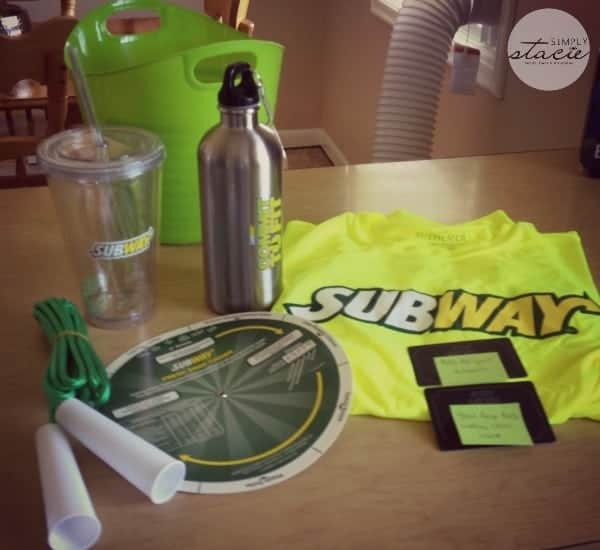 I hope you’ll join me over the next six weeks as I share my experience participating in SUBWAY Canada’s Commit to Fit challenge! I’m a little nervous because fitness has never been my forte especially over the past 8 years. I have chronic pain so running, biking and anything too strenuous hasn’t been an option for me. One thing I can do is walk! However, I’ve been procrastinating even doing that so I think this challenge is the kickstart I need to finally get in better shape. Every Monday for the next six weeks, Carl Savard, the Canadian Commit to Fit Ambassador will email a weekly challenge to myself and the other participants. We will then have until the following Monday to complete the challenge and share our experience on our social channels. You can see how I’m doing and the other participants as well by following the hashtag #CarlsCrew and/or #CommitToFit. This week, the challenge is to complete a 20 minute daily activity. It can be something simple like going for a walk or run or even doing some cardio in the comfort of your living room. I knew exactly what my challenge would be: walking. I used to LOVE walking and even when I had pain, I still did it. My physiotherapist recommended walking as exercise for me, but over the years, I heeded her advice less and less. I’m ready to get back into it. Yesterday, I went out for a 20 minute walk in our neighbourhood. I didn’t want to venture too far from home in case I did have any issues. I walked down into our subdivision to a park and took in the view of a gorgeous field beside it. The fall colours are really starting to come in now! It was refreshing to get outside and I felt invigorated when I came home. Most of all, my confidence level went up because I completed the walk with no pain. I showed myself that I can do it. Join me and let’s work together to get healthier. Take the SUBWAY Canada Commit to Fit Pledge on Facebook. I’m a rookie right now but hoping to change that as time goes on. I’ll be sharing my progress over the next six weeks and you can also expect some giveaways too! Join us on Thursday, September 25 at 8:30 pm for our #CommittoFit Twitter Party! One Canadian reader is going to win a $25 Subway Gift Card! Ideally swimming – not just great exercise but soothing to stretched muscles – overworked on the treadmill. Wow, I totally copied an above comment without thinking. Sorry. 🙂 I can think original thoughts. Jogging or an exercise video. Walking and with the fall leaves coming it’s going to be nice. sorry did not seen that it was only for canada before i entered the comment entry please don’t count it. I would love to swim for twenty minutes! Walking- just did 100 km in the month of sept!